Due to its thin and light design, the iPhone 5 is prone to getting into a case quickly for various purposes, without adding too much bulk and weight, as it would be with a larger or heavier handset. One such purpose is extending the battery life of the phone with an add-on unit integrated in a case. Some makers are taking their sweet time (looking at you, "coming in the spring" Mophie!) after the initial handset launch to develop and test such wrappings with the new Lightning connector, but now major brands have come with battery case versions for Apple's newest iPhone, some due to be released as soon as this month. In the meantime, Chinese companies are filling the void, but the reviews of their products often find it adviseable to wait for a reputable brand to release a more solid battery case for the newest iPhone. We saw a few very intriguing offers at CES that will hit the stores soon, though, that's why we are listing some of the best battery cases that can double the mileage out of your iPhone 5 and more, in the slideshow below, so check it out if you are in the market for one. Tylt's Power Case for the iPhone 5 from its Energi line of products made the rounds at CES due to the innovative solution of the old puzzle how to keep a battery case on and dimensions slim. Well, it just doesn't try to do it, as it's hard to be done. Instead, you put on a slim Presto hardshell case that protects the iPhone 5, and when you need extra juice, you just slide the slim case into another one with embedded 2,500 mAh battery, that more than doubles your handset's battery life. The Power Case is coming soon with no price attached yet, but Tylt has a battery case for the Galaxy S III, and with a kickstand at that, which runs for $79.99, so the iPhone 5 one shouldn't be far off. Lenmar's 2,200 mAh Meridian battery case for the iPhone 5 will be released January 30, and is one of the slimmest you can find at just 15mm thick. It costs $89.99, and is available in three colors and texture finishes - Rubberized Black, Metallic Red, and Glossy White. uNu's battery case will be shipping next month, but it is available for preorder now at $79.95. It is very slim at 15mm, houses a 2,300 mAh unit, and has Lightning-to-MicroUSB port, so you can sync and transfer files from the iPhone 5 while in the case with a regular USB cable. 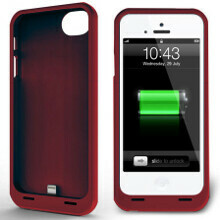 The thin form factor of Joy Factory's Ergos 2,100 mAh battery case for the iPhone 5 ensures it won't be an unsightly addition to your handset, and it will be available in a number of colors. The case has two versions - the one with the kickstand costs $89.99, and the one without is 10 bucks less, while both are coming in February. Available next month, Incipio's OFFGrid line arrives to the iPhone 5 in two versions - the regular one with embedded battery costs $80, and comes with a 2,500 mAH battery, and the PRO case variant ships with not one, but two detachable 2,000 mAh units, and a charger that can house them both for one portable 4,000 mAh juice pack. TYLT has got some of the best stuff on the market, I have no doubt that its ENERGI case for the iPhone 5 will keep the same standard. It would be cool to see an iPhone 6 Maxx. New UI. New design. More battery. More memory. More RAM. Quad Core. Better camera. Larger display. I lve liked 4.5" the best personally. (the 4" being the iPhone mini lol). Real loud external speaker to play music like a desk top player. Wouldnt that be a killer phone? It's funny how everything you just described can be obtained with an android. Ur comment more funny! It's like comparing a bus and Audi. Lol. Get these unique iphone cases in iCase-Zone.